A few weeks ago, I was working with kindergartners and needed to come up with something to entertain them for about 30 minutes to buy the other teacher some time to deal with a situation. Here’s what I whipped up: Bingo! I helped the kids draw squares on a blank piece of paper. Then I instructed them to draw (one at a time) various simple objects. “Hold up a yellow crayon. Now choose any square and draw a yellow banana.” This allowed me to review colors with them, while allowing for structured creativity. When the kids finished drawing the assigned picture, I’d have them point to something round, something flat, something shiny, etc. to keep everyone busy while the other kids finished. In previous similar activities, some of the kids would forget what their picture was of, so as a review, I asked them to point to specific pictures after drawing a few new ones. If I had wanted to review numbers, letters, etc. I could have asked them to draw a green six, or a red letter J, but I only thought of that after the fact. 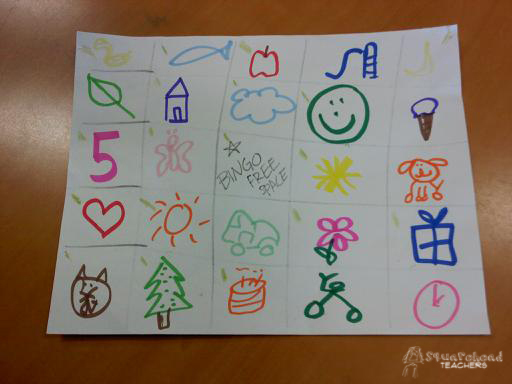 We played bingo by drawing an X through the box once we played it. The bingo part of the game was a bit trickier than making the board, but everyone seemed to have a good time anyway. This entry was posted in Art/Crafts and tagged Bingo, Children, Elementary School, Homeschool, Kids, Teacher Resources by Squarehead Teachers. Bookmark the permalink.